Representatives of 1,250 armed police officers who protect UK civil nuclear sites have challenged a rule forcing them to work beyond the age of 60. While most UK police can retire at 60, Civil Nuclear Constabulary officers must work until 65 under a new law. The Civil Nuclear Police Federation says it will be "physically impossible" for officers in their mid-60s to protect the public from terrorism. It has taken the case to London's High Court to try to get the rule changed. It argues its officers have the most physically demanding role in the police service and will not be able to maintain their standards of fitness and weapons proficiency into their 60s. A government spokesperson said the Civil Nuclear Police Authority - which oversees the Civil Nuclear Constabulary (CNC) - was "considering how to implement changes and reforms". The changes were brought in as part of the Public Service Pensions Act. The standard retirement age for almost all police in the UK is 60, with many able to leave on a full pension in their 50s. But under the new laws affecting public service workers - due to take effect next April - CNC officers will have to work until they are 65, and eventually 68, to receive their pension. The federation believes this is due to a legal anomaly, and is trying to persuade the High Court that its officers should be exempt from the retirement age rise. Martin Westgate QC, representing the federation, told the High Court that if the ruling stood, it would put CNC officers "out of step with the vast majority of police officers". Operational demands on officers in other territorial forces were variable and they could move posts if they were no longer able to meet the highest standards, he argued. However, he told the court that option was not available to the CNC, which he argued was intended to be a 100% firearms capable force. Unlike other forces that are in the headlines nearly every day - the Met, West Midlands and Greater Manchester Police, for example - you don't hear a lot about the Civil Nuclear Constabulary. Much of its work goes unseen, guarding nuclear sites in remote corners of the UK and protecting material in transit. However, it is vital work, particularly at a time when the terrorism threat level is graded "severe" with an attack assessed as "highly likely". That's one reason why its officers are incensed - and baffled - by pension changes which mean they'd have to work until at least 65 before retiring. The problem, it seems, is that when the new rules were being drawn up under the coalition government, the CNC, which is the responsibility of the energy minister, wasn't treated the same as other forces, which were permitted by the home secretary at the time, Theresa May, to maintain a retirement age of 60. 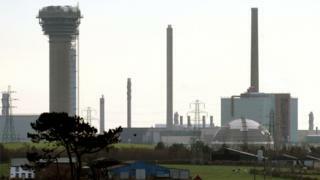 Chief executive Nigel Dennis said it was "regrettable that we have been forced to take legal action". "As a police force the CNC is the fittest body in the UK because of our role in protecting nuclear assets and our more recently acquired role of protecting the wider public against terrorist outrages," he said. "It makes no sense that we should be saddled through inappropriate legislation with a retirement age which we have little or no hope of reaching. "Neither can I believe that the public will feel protected if eventually we have aggressively armed police officers in their mid-60s being deployed against terrorists." Mrs Justice Nicola Davies has said she will give her ruling on Friday afternoon.